Kick-start your artistic skills with a project that you never need to set up or put away. Use your hands and set yourself free on the paper. When you’re finished for the day, simply pull the curtain closed to enjoy instant calm. 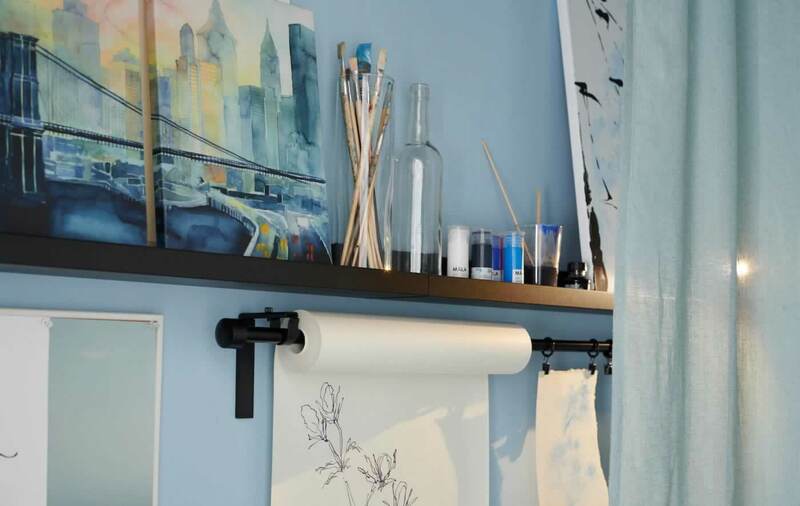 Attach a roll of paper to the wall so you always have something handy to draw, paint or sketch on. Hang up bigger brushes and keep smaller ones in glass containers ready for when inspiration strikes. Then use a picture ledge to display your finished art work. Let a drawer unit on casters work as both a desk with storage and a smart place to put your gadgets (and charge your smartphone at the same time). When your art project is in “off” mode the drawer unit works as a stylish coffee table and the flower still life makes a welcome addition to your living room deco.